Samsung was the talk of CES 2013 with its UN85S9 85-inch TV that looked more like a chalkboard than something you would watch your favorite programs on. What was missing at the announcement, however, was the price. Are you prepared for some sticker shock? Ultra High Definition is just making its way in to the marketplace with its 4K resolution, and with any new technology there will always be a high barrier to entry. But are there really enough people out there with the resources to drop $39,999 on the S9 85-inch set when it launches this month to make it worthwhile to even produce? Even if you discount the very odd physical design of the set, it's difficult to imagine that the Korean manufacturer will be able to move enough of these to even make it worth it. And will there even be enough stores willing to display it considering how much floorspace it will take up. In a not so painful part of today's announcement, the pricing for the Smart Evolution Kit was finally revealed. For $300, owners of certain Samsung television models will be able to snap this device into a port on the backs of their televisions and enjoy the latest processor and GPU advancements the company has come up with. The kit will sell for $300 and include the latest iteration of the smart remote. Pricing still hasn't been revealed for the remainder of the smart TV lineup for this year, including the F8000 which the TechnoBuffalo team fell in love with, but those should be announced soon. Ridgefield Park, N.J., March 20, 2013 – Samsung Electronics America today announced a new Smart TV experience that simplifies how consumers search for and discover their preferred content, while raising the bar in picture quality. 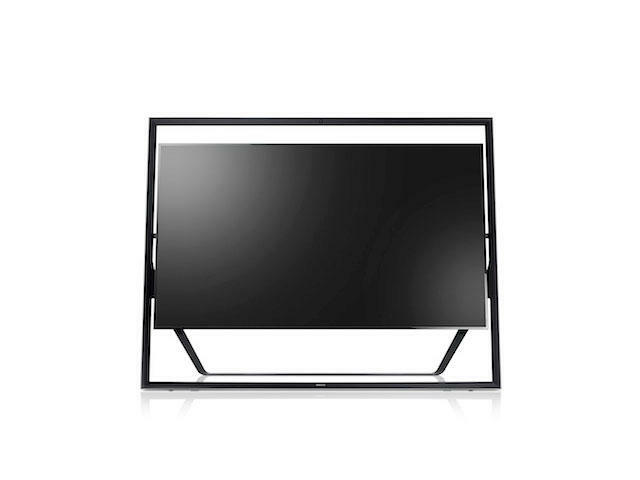 Its highly anticipated line of 2013 TVs will begin shipping this month in the U.S., beginning with the LED 8000-series and the Plasma 8500-series. "The TV industry is undergoing a sea change in both content and technology. Although consumers can now access a plethora of content from myriad sources, finding and choosing their favorite content has become even harder. Our 2013 Smart TVs make it easy for you to spend less time searching for shows and movies, and more time discovering and watching the content you love," said Joe Stinziano, Executive Vice President, Samsung Electronics America. "Samsung has also created an evolutionary TV, so the TV that consumers buy today will transform into the TV of tomorrow. Thanks to the world's first Smart Evolution Kit, consumers will have the latest features and they won't be left behind." A redesigned Samsung Smart Hub that offers five dynamic menu panels to help consumers manage and navigate different types of content. With S-Recommendation, consumers can easily find the content they want – whether on TV or via premium VOD services – thanks to personalized recommendations based on their viewing habits over time. Outstanding picture quality across the 2013 lines. Samsung's UHD TV and LED TVs offer brighter, more vibrant color, and its flagship Plasma TV delivers deeper blacks and brighter whites than previously seen on plasma models. Smart Evolution Kit gives owners of flagship 2012 Samsung TVs the opportunity to update their models with some of the latest features from 2013 without having to buy a new set. A quad-core CPU enables quick app launching, web browsing and multi-tasking. Smart View lets consumers move content seamlessly from the TV to connected devices and back in real-time, so consumers never miss a moment of their favorite shows using AllShare. Advanced Smart Interaction allows consumers to use everyday language and casual gestures to control the TV. From Smart Evolution, to a re-designed Smart Hub, to the unmatched picture quality of Samsung's UHD TV, Samsung has created a full suite of smart products and solutions that allow consumers to engage with and experience their TV in new ways. Movies & TV Shows – an easy view of movies and TV services and over-the-top content that are available from various content providers. Samsung has also created the first-ever recommendation engine for TVs to help consumers navigate the overwhelming amount of content available. Samsung's S-Recommendation gives consumers a unique way of discovering content based on their personal preferences. It analyzes consumers' past viewing habits over a period of six months to "learn" their preferences so that it can recommend similar content. The recommendations are provided from a variety of sources, including broadcast television as well as streaming services. Smart Interaction has also been upgraded with the ability to recognize natural language use (such as full phrases) as well as more casual hand movement (like swiping to change screens). To ensure consumers continue to enjoy the best experience from their Samsung TVs, Samsung's Smart Evolution Kit, an industry first, offers a cost-effective way for consumers to update their TVs with the latest technologies and features. The kit fits into the evolution slot on the back of 2012 Samsung 7500 and 8000 Series LED TVs, as well as Samsung Series 7000 and 8000 Plasma TVs, and updates them with some of the latest features and functions included in the newest Samsung models. 2013 F7500 LED and above and F8500 Plasma TVs also include a Smart Evolution slot. The 2013 Smart Evolution kit includes a quad-core processor, GPU and memory for faster processing and multi-tasking, the updated Smart Hub and the latest picture display software. The Smart Evolution Kit is packaged with the 2013 Smart Touch Remote, and will be available in May for $299.99. For consumers that desire the very best in home entertainment, Samsung's S9 UHD TV represents an industry breakthrough both in picture quality and design. Samsung's Precision Black Pro technology delivers deep, real blacks and pure vivacious whites, while the combination of an extremely high contrast ratio and Ultimate Dimming control functionality means consumers will experience the sharpest resolutions ever seen on large format displays. In addition, Samsung's proprietary up-scaling engine up-converts HD or Full-HD to UHD-level picture quality by restoring detail information to create greater precision and real-life picture quality. The S9's 3-way 2.2 channels of 120 watt sound also delivers an audio experience that is six times better than a standard TV, so consumers can truly immerse themselves in the experience, almost like they were in the thick of the action. This 85-inch UHD TV also offers a timeless design – the TV appears to float within its thin frame – which challenges traditional concepts of TV design. The UN85S9 will be available will be available for pre-order on Samsung.com at the end of March for $39,999. The F8000 series, Samsung's 2013 flagship LED Smart TV, boasts a stunning design that complements any room in the home. It offers the most vibrant and richest colors with the highest contrasts and the brightest picture quality of any Samsung LED TV to date. Samsung's proprietary Micro Dimming Ultimate technology provides greater contracts, deeper black levels and maximum brightness – along with the full suite of Samsung Smart features. Consumers will enjoy the speed at which they can browse the web or download and access apps, thanks to the TV's quad-core processor, a first in the industry. The F8000 will be available this year in size classes ranging from 46″ to 75″ at varying price points. Samsung's F8500 Plasma TV, 2013 flagship plasma model, is the new industry standard for TV excellence offering deeper blacks and brighter picture quality than previously seen on plasma TVs. The F8500 delivers the same brightness and eight times the black levels as standard LED TVs, thanks to Samsung's proprietary Deep Black Algorithm and Real Black Pro II. The F8500 is also one of the first televisions with native support for HEVC-encoded content, which delivers the richest, most immersive content. With Samsung's One Body Form design, the F8500 is created from a single piece of metal while highlighted with a dark titan metal color for a futuristic design. The F8000 will be available this year in several size classes ranging from 51″ to 64″ at varying price points. Samsung unveiled its unique vacuum tube amplifiers in 2012 with its wireless audio docks. The vacuum tube offers audiophiles the best of both worlds – the warm richness of a tube amplifier with the power and precision of digital technology. The company today demonstrated a continued commitment to raising the bar in quality audio by expanding the line of digital audio products that offer this successful hybrid tube technology. New in 2013, Samsung's vacuum tube technology will be integrated into the HW-F750 soundbar so consumers can enjoy the rich, powerful sound quality they desire. A wireless sub-woofer means consumers have even greater flexibility in setting up the system, so as to maintain their clean and minimalist décor. The HW-F750 also connects wirelessly to select 2012 and 2013 Samsung Smart TVs via Bluetooth, which means the soundbar may be connected without any audio cables, making set up a breeze. The Soundbar will be available in March for $799. The vacuum tube amplifier can also be found in Samsung's home theater systems, beginning with the HT-F6500W, for improved audio clarity and warmth. The Blu-ray component of the HT-F6500W also offers Samsung's latest Smart Hub and AllShare features, along with full web browsing capabilities. The HT-F6500W delivers outstanding value at $599, and will be available in March. Consumers can now enjoy crystal clear sound wherever they are with the DA-F60 portable wireless Bluetooth speaker. Despite its compact size, the DA-F60 delivers a full-range sound reproduction that is on par with larger and more expensive systems. The speaker's integrated Near-Field Communications (NFC) connectivity makes it easy for consumers to pair the speaker with other NFC devices, such as a smartphone or tablet, by simply tapping the two devices together. It also connects wirelessly to select Samsung 2012 and 2013 Smart TVs and other Bluetooth-enabled devices for an effortless and streamlined music playing experience. With 12-hour playback on a full battery charge, consumers never need to worry about being without their music. They can get their hands on this stylish speaker from April for $299. Samsung today also entered a new category in home audio with its first-ever 2.2 channel Giga Sound Systems. The MX-FS8000 and the MX-FS9000 both feature powerful 15″ dual sub-woofers that deliver 2300W and 2560W in sound respectively for stand-out audio. The sound systems offer wireless streaming via Bluetooth technology, so it is easy to sync the systems to compatible devices and play music from CDs, USBs or streaming audio services. With its special DJ Effects and DJ Lighting features, as well as its ability to support mic input, an evening of entertainment will never be the same again. Samsung's flagship MX-FS9000 will be available in May for $1,499 and the MX-FS8000 will be available in June for $999.